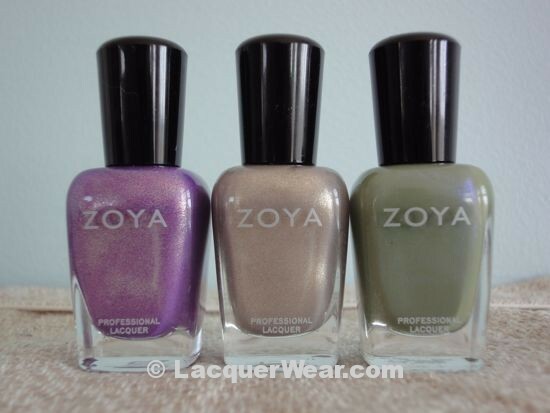 The last three polishes from Zoya’s Intimate Collection are a little bit bolder than the first three I wrote about in Part 1, but still perfect for spring. The finishes in this half of the collection are really nice–Dannii and Jules are metallic shimmers and Gemma has a duochrome flash of bluish purple. Dannii is a bright and bluish purple with so much pink and gold shimmer that it’s a bit metallic. It’s nice to have a color like this but with a shimmery, flashy finish, rather than the creme finish that a lot of pastel-leaning purples have been lately. It reminds me of hyacinths and lilacs. Jules is a grey-ish beige with the same shimmery/kind of metallic finish as Dannii. The finish also makes this one stand out from all of the greige and taupe colors lately; it’s sparkly and just made for spring sunshine. I think the sparkle makes it look lighter and fresher for spring, but I also think it works as a fairly restrained neutral color, that I could wear to work. When you look at the sides of my nails where the light isn’t hitting, the color has hints of lilac and pink, too-it’s delicate and shadowy. It reminded me a bit of Dior’s Timeless Gold from Holiday 2010. Timeless Gold is a full-on metallic, but it also has a delicate hint of grey and is a sort of silver-gold mix. In the picture below, it’s on my ring and pinky fingers, with Jules on my index and middle fingers. You can see that Timeless gold has more metallic flash than Jules, and reflects the light more strongly. But both of them really do have nice grey undertones. Jules seems like the softer, more fleshy version of Timeless Gold to me, nice for spring. Gemma is a leafy olive green color with a hidden shimmer of blue-purple. It’s not that strong of a shimmer, but I could see it on my nails when I moved them in the sun. Variations of this color have been common lately–Rescue Beauty Diddy Mow, Chanel Khaki Vert and Essie Sew Psyched to name a few-but I think the shimmer in Gemma softens this color even when it’s not really catching the sun and makes it more delicate, or maybe a bit lighter, than the others. It seems slightly more bluish and muted. I’m really liking this collection and I’m planning to wear all of these colors this spring. I still think that Caitlin is my favorite of the bunch (I reviewed them in Part 1, which you should read if you haven’t yet! ), but they’re all nice to have. The finishes set them apart, even from other similar colors. Thanks! I’ve been using Essie’s Rock Solid basecoat (bought at WalGreens) lately, and I used it for these swatches, too. I was having trouble with bubbles in general and tried a few basecoats (Poshe and Revlon), but the Essie has been bubble-free on me so far. I didn’t use a topcoat for these pictures. Pingback: Zoya Marley w/ Orly Winter Wonderland – kind of like Pizzicato?